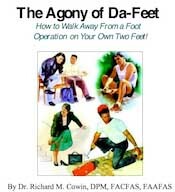 Morton’s Neuroma occurs when one of the nerves on the bottom of the foot becomes “pinched” between two adjacent metatarsal bones or the base of the bones of two adjacent toes. Fibrous tissue builds up around the nerve and the condition generally worsens. 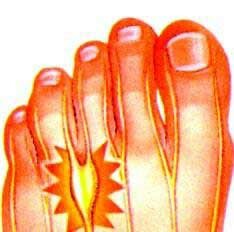 Patients generally experience sharp pain on the bottom of the end of their feet radiating into two adjacent toes, most frequently the third and fourth toes. Conservative treatment includes ethyl alcohol injections, cold-water soaks, and sometimes orthotic arch supports to control motion of the foot. Surgical treatment is indicated if these fail and involves removing the inflamed section of nerve via Laser. This procedure can usually be performed on an outpatient basis at Laser Foot Surgery Specialist.